Using the same aluminum screening that I used for the Ribbon Tree and the Rosette DIY ornaments, I crafted a Daisy design. 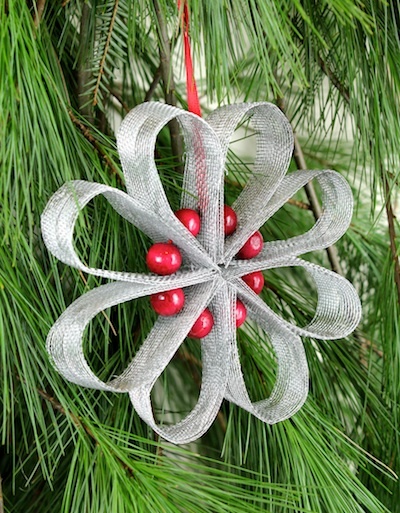 It combines the red wooden beads with the silver screening in a totally different circular motif. 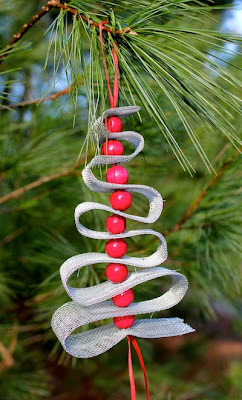 And, just like the other two designs I am creating a tutorial so you can make the same ornament. This series is truly easy to do and they are very universal. They are unbreakable so a great solution for a house with kids or cats! 8 pieces aluminum window screening 2" w x 6" long - I purchased 1 roll of 36" x 84" bright Aluminum screening at Lowes. 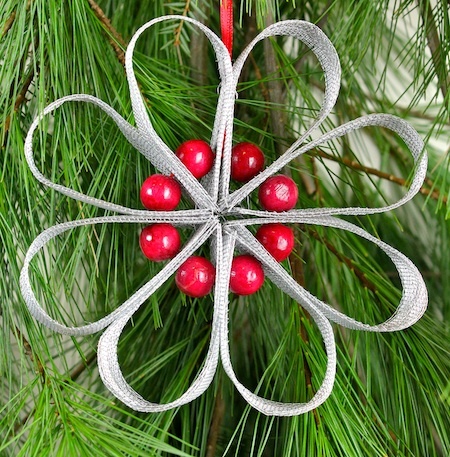 You can vary the size to create different sized ornaments. 8 - 1/2" wooden red beads - I bought a red bead garland and cut them off. 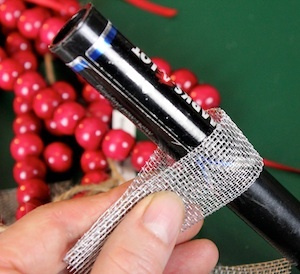 Using a Sharpie marker and ruler, measure 8 pieces of screening 2" w x 6" long. 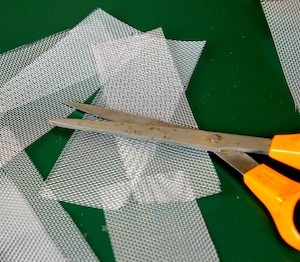 Use dull scissors to cut the screening. 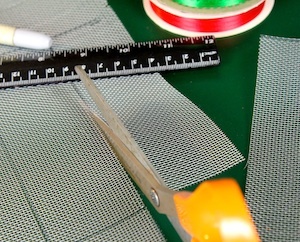 I like to wear garden gloves during these first steps because the edges of the screening are extremely prickly. Fold over both long edges on all 8 pieces of cut screening. I bent it over the edge of my desk top to form a straight fold. 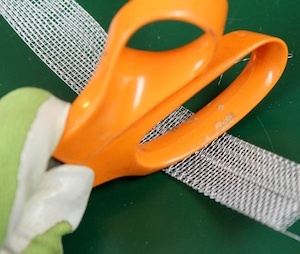 I first used my finger to crease back the folded edge and then ran the handle of the scissors along it to smooth it out. 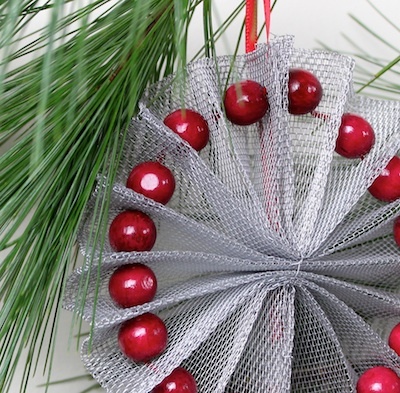 Using something round as a form, bend each of the 8 pieces in half but a curved half - not a crease. 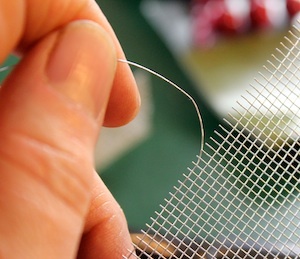 Pull a strand of aluminum "thread" off the edge of a scrap piece of screening. 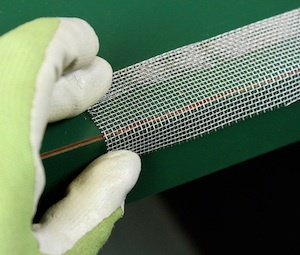 Use this thread to stitch together the two ends of each piece of screening. 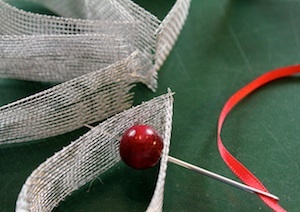 Take a piece of 1/8" red satin ribbon and thread it onto a large darning needle. 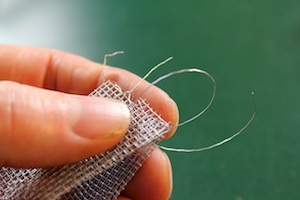 Thread it through the screen about 3/4" up from the stitched seam. 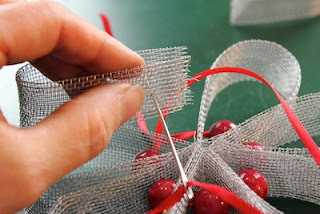 Thread a bead onto it. Thread it out the other side of the petal shape. Thread it into the next petal shape again about 3/4' from the stitched seam. 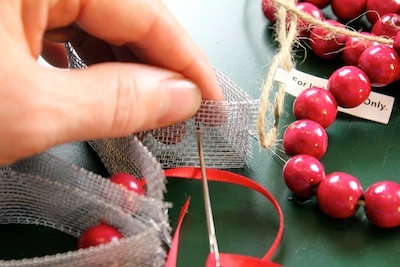 Add another bead and continue through and out the other side. Add another petal shape, then a bead, continuing until all 8 have been threaded together. You may need to adjust the shape of your 8 "petals" so they form a complete circle. When you have all eight connected, tie the two end of the ribbon together leaving enough to make a hanging hoop. Add them to your collection from my previous two tutorials. love it! 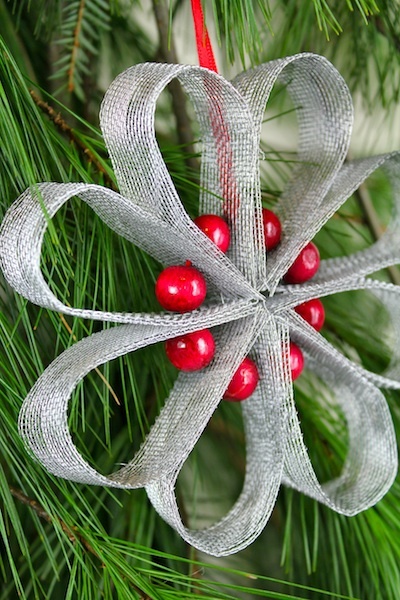 But I think I want to try it with wired ribbon! I would cut myself for sure on the screening! 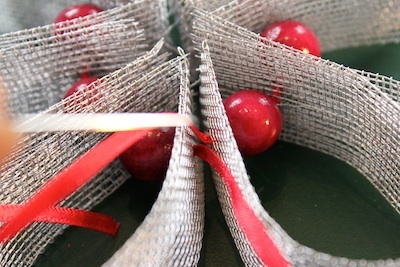 Karenduch -I wore light weight garden gloves for the first few steps. Once the edges were bent over and creased the screening material no longer poked me and I didn't need the gloves any longer. This is fab, I would have never thought to use that material, but it most look lovely. Love this, hoping to use it to create some great things for our church.